Enjoy bear viewing, fishing, a Backcountry Adventure or "Call of the Wild" a meal at a lodge or on a remote lake. On any excursion look for Dall sheep, moose, bears, birds, marine wildlife, rivers, lakes and dense forests. Our pilot and guide will keep you informed about the sights over the aircraft's intercom system and headsets. 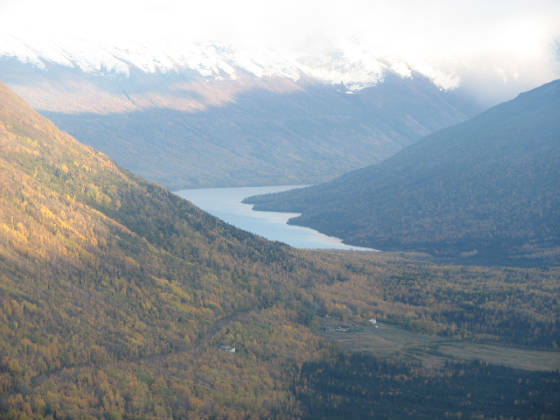 Fly over the Arm and through Turnagain Pass to Seward, home of the Silver Salmon Derby. Next fly over Kenai Fjords National Park, and the Harding Ice Field. Return by way of Skilak Lake and Kenai National Moose Range. Enjoy a scenic flight, fly the Neacola volcanic Mountain Range. Experience the thrill as the plane slips through Lake Clark's tight pass and by its' high cliffs, look for abundant wildlife and the chilly blue waters of Lake Clark. 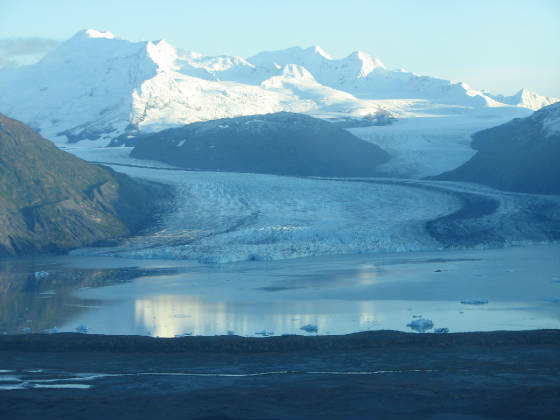 Fly over Anchorage and see the city, then along the Chugach Range to the Knik Glacier. View the massive crevasses, the glacial-fed pools and Lake George with its floating icebergs. Then return over the silty Bore Tidewaters of Turnagain Arm to Anchorage. See the legend come alive! Fly over the mud flats where one of the largest concentrations of waterfowl may be seen. Pass over the many tributaries of the Susitna River to the base of Mount Susitna (the "Sleeping Lady"). Farther west Mt. Gerdine, Mt. Torbert and Mt. Spur in the Tordrillo volcanic mountain range can be viewed with their massive glaciers and aqua pools. Fly through Portage Pass and over Whittier. Follow the Turnagain Arm to the Chugach Mountain Range, look for rock climbers or Dall Sheep on the nearby cliffs. As we climb above the mountains, view the many glaciers in the area. Return to Anchorage by way of picturesque Eagle River Valley or the Arm. Take a shorter jaunt. Fly toward Recreational Big Lake and over to Alexander Creek (one of Alaska's best salmon fishing aeras). Return to Anchorage by the way of Mount Susitna, and the Susitna River, to look for the wildlife. Just a hop, skip and jump away, take a short scenic flight over Potter's Marsh and the Turnagain Arm. to the small gold mining community of Hope. Return by way of Arctic Valley or Beluga Point, where there might be a chance of spotting playful whales. A few minutes away from downtown Anchorage, take a scenic flight over Big Lake, one of the largest recreational lakes in the area. Enroute pass over Earthquate Park and Goose Bay, much of which was formed as a result of the 1964 Earthquake. Follow the Little Susitna River and look for the "wildlife", both fisherman and moose may be seen on your way back to Anchorage. Fly over the Anchorage bowl, along the Chugach Mountains, to Turnagain Arm, across to Hope and return by way of Beluga Point. On most flights, you can add a stop on a remote lake. Tours can be extended to take in additional areas of interest such as Homer, Katchemak Bay, Port Alsworth, Valdez Oil Terminal, Talkeetna, Hatcher Pass/Mine or "Call of the Wild" a picnic on a remote lake. For those of you looking for a rare treat, how about a fly in picnic on a remote lake. Feed your animal hunger, "Call of the Wild". Enjoy a low level flight to and from a lake and while enroute take in some of Alasks's picturesque backcountry. Land on a remote lake to have lunch while watching Bears eat their fill of salmon. Fly over Alaska's back country, looking for bears or moose, and Cook Inlet for whales. Take a short flight and enjoy some of Alaska's best fishing. Spend a day or several on a remote river or lake, fishing for salmon, trout, grayling, pike or dollies. Experience the thrill of hooking the "Big One."